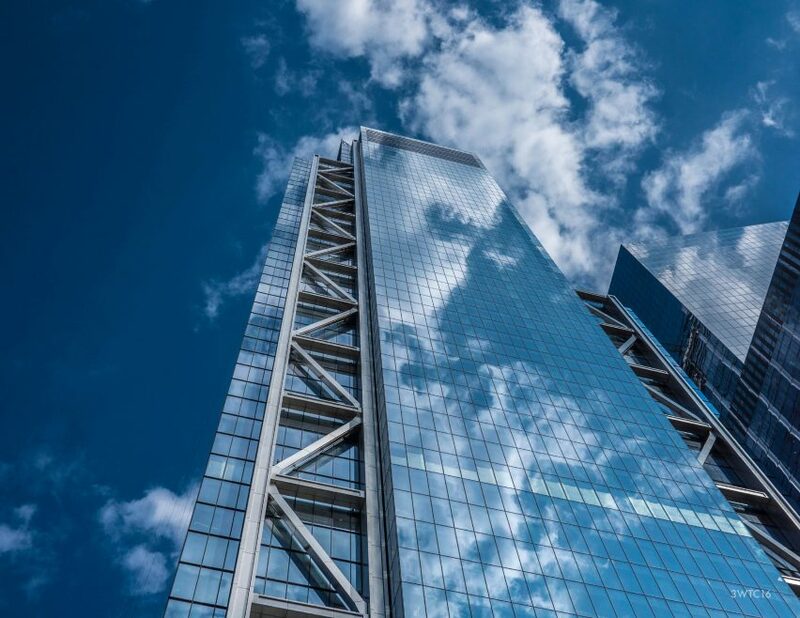 Architecture firm Rogers Stirk Harbour + Partners has completed the construction of Three World Trade Center in Manhattan, which is now the city’s fifth-tallest building. The skyscraper spans 80 storeys and reaches 1,079 feet (329 metres) high, making it currently the second tallest building at the redeveloped World Trade Center site. External construction work in complete – as celebrated at an event yesterday, 11 June 2018 – but many of the interior spaces are yet to be fitted out. Also known as 3WTC, the building is surrounded by 10,000 floor-to-ceiling glass panels and based on a reinforced concrete core. Steel girders and beams form a lattice K-shaped pattern up the sides of the tower. All of the corners are without columns and are shaped by an exterior glass and steel bracing system. This bracing is finished in stainless steel to complement the reflective glass. The design is typical of the firm’s work, which includes a set of residential high-rises across from the Tate Modern in London that feature a similar external bracing system. Located at 175 Greenwich Street in Downtown Manhattan, 3WTC is a mixed-use building with plans to include offices and private residences. The first three storeys and two below grade are designated for retail. A 60-foot-tall (18-metre) lobby has expansive glass walls that appear to float down for the upper storeys. 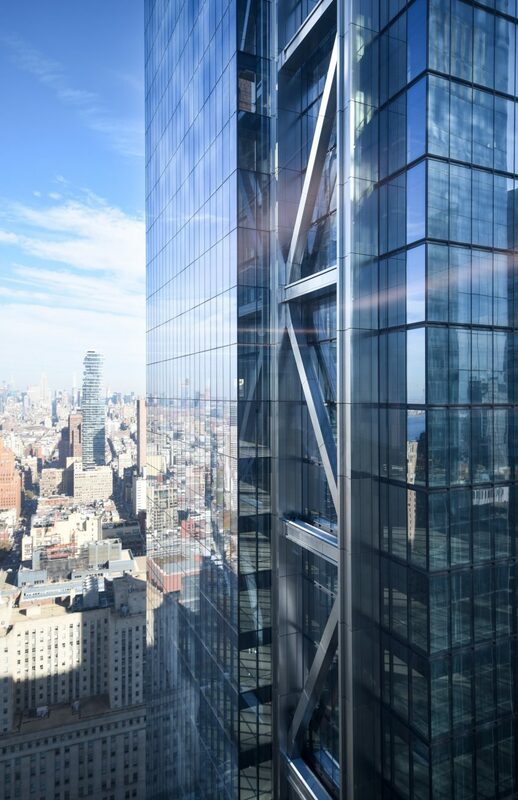 A cable net of glass walls forms a gridded facade, comprising laminated units that are five feet (1.5 metres) wide and 10 feet (three metres) long across the tower. 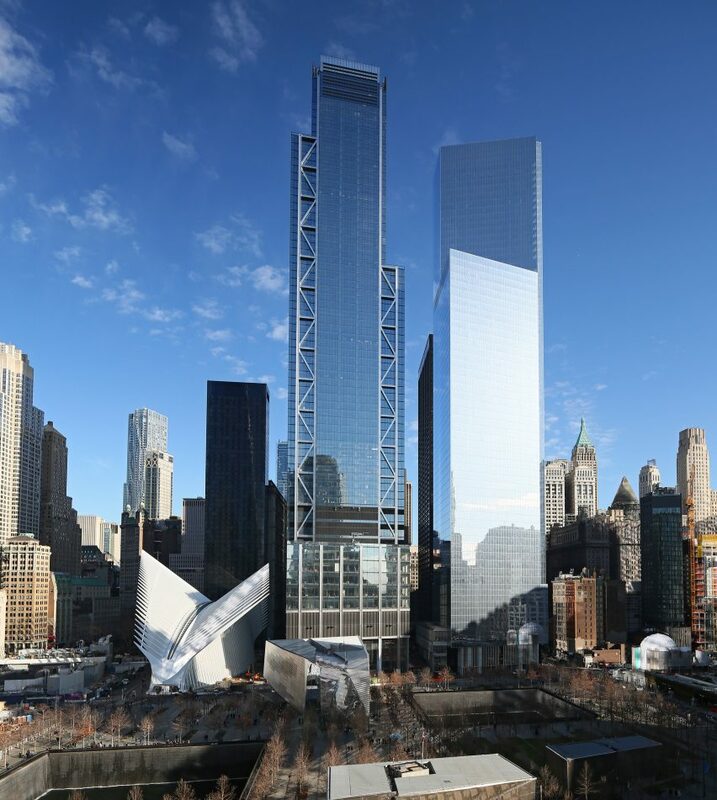 3WTC’s rectangular windows echo those on its closest neighbour, Four World Trade Center by Japanese architect Fumihiko Maki, so two appear as a pair. 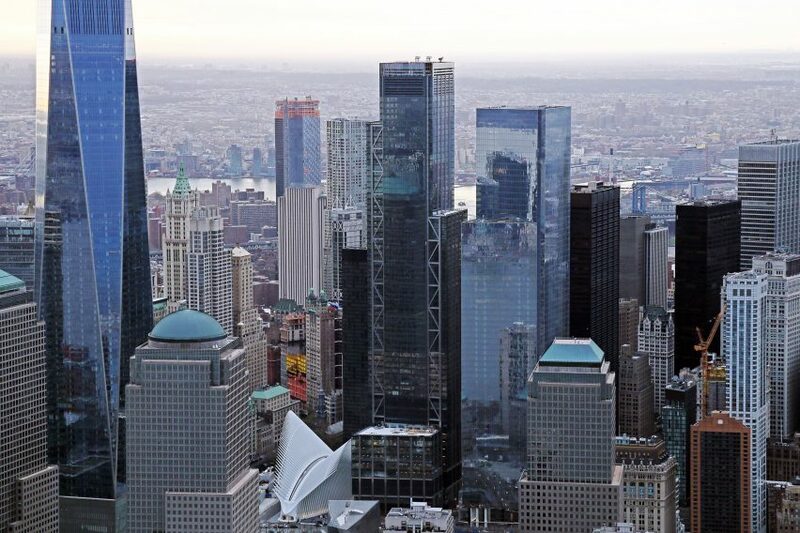 Both were developed by Silverstein Properties, which has the rights to the land where the Twin Towers formerly stood before the 9/11 terrorist attacks. 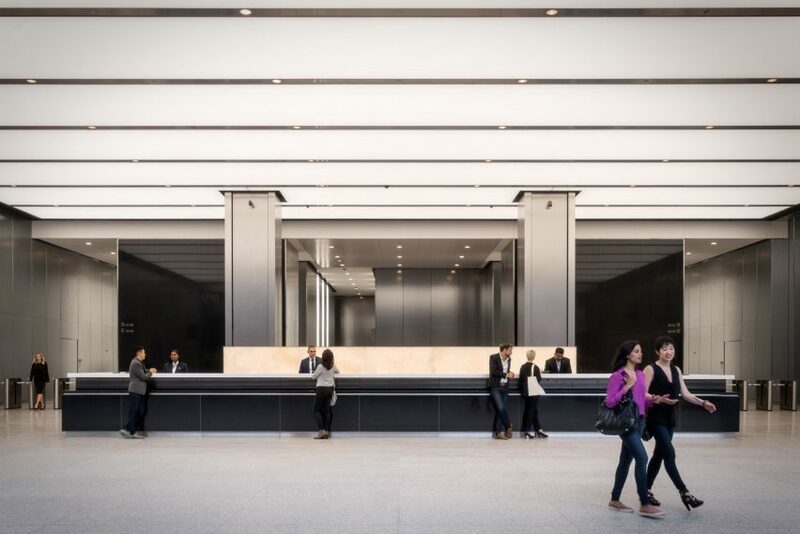 Beyond 3WTC’s glazed perimeter is a high wall design that demarcates the lobby inside, with a black Zimbabwe granite slab overhead. Floors are lined with Sardinian grey granite, while other surfaces kept white. For ventilation, air is drawn into the building from high up the tower – so it is supposedly cleaner than at ground level – and then filtered to remove chemical pollutants. “All occupied spaces of the building are supplied with more outside ventilate air than required by code,” said a statement. The building is equipped with 44 passenger elevators, and five freight or service elevator shafts. The passenger elevators use a high-speed system by Schindler, which allows users to rise to the 17th floor in under three seconds. Three terraces are included in the tower, on floors 17, 60 and 76, with the upper two being privately owned by companies. The top terrace is currently the tallest outdoor office patio in Manhattan, at 935 feet (285 metres) above ground level. The tower is part of the greater World Trade Center (WTC) campus, which includes SOM’s One World Trade, which welcomed its first tenants in November 2014, and Spanish architect Santiago Calatrava’s Oculus, which serves as the WTC Transportation Hub. Across from the entrance are the Twin Tower memorial fountains, where water cascades into square basins where the two skyscrapers once stood. 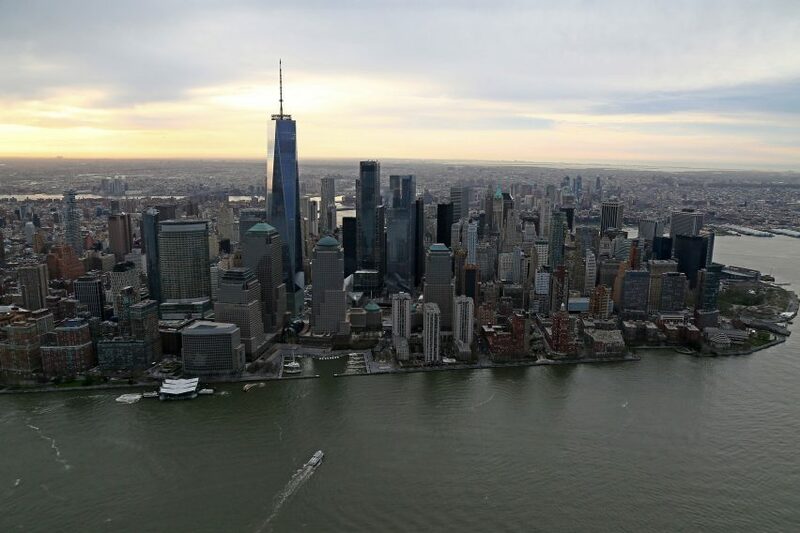 The entire WTC campus is spearheaded by Silverstein Properties in collaboration with the Port Authority of New York and New Jersey, which owns most of the property. 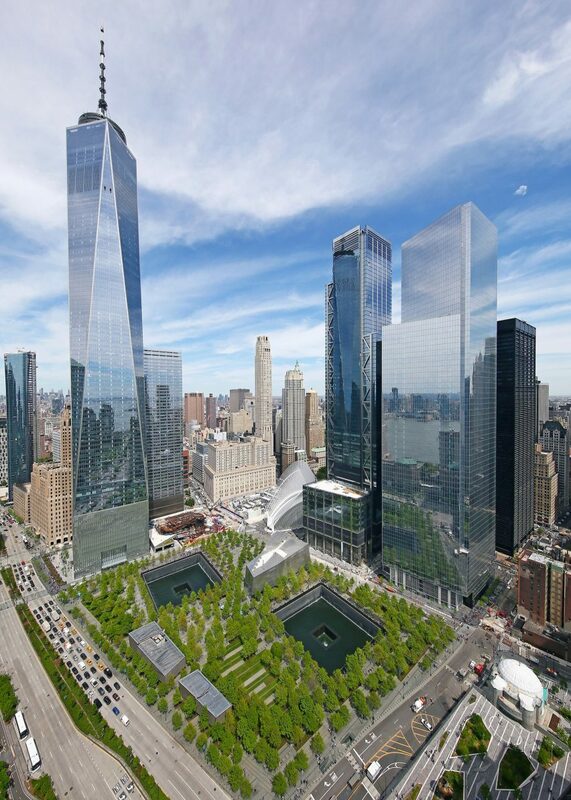 The WTC Master Plan was first developed by American-Polish architect Daniel Libeskind to include six towers in total. Still to rise out of the ground is Two World Trade Center, which was originally designed by Foster + Partners but was replaced with a scheme by BIG. Also under construction on the site is a performing arts venue by REX, which will take the form of a translucent cube. Rogers Stirk Harbour + Partners, which was founded by architect Richard Rogers and ranked 99 on the 2017 Dezeen Hot List, has previously completed skyscrapers including London’s Leadenhall Building – also known as the Cheesegrater. Photography is by Joe Woolhead.